when it comes to TREE, eco-wood is what we’re all about. we’re passionate about wood that meets the highest standards of sustainability and quality, and that looks beautiful too! we think the magic of wood lies in its variety and individuality. when you visit our stores or browse our website, you’ll find an array of pieces crafted from wood that is either reclaimed, recycled, FSC™-certified, or helps keep our forests replenished through our partnership with Trees4Trees, ensuring that the highest standards of sustainability are met. 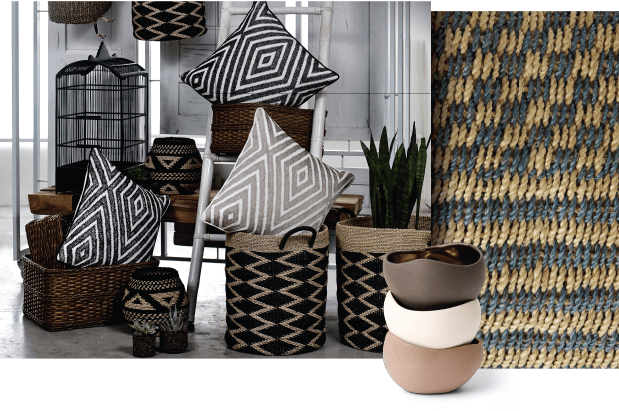 choose from an extensive variety of tones, grains and finishes – light or dark, fresh or rich, rustic or polished, there’s a sustainably stylish piece to suit every style and space. solid teak is our heartland. it’s unendingly popular with those looking for painstaking craftsmanship, beautifully straight grains and naturally warm hues. love hosting dinner parties? have a brood of spirited kids? if durability and easy care is top of your list, then teak is for you! 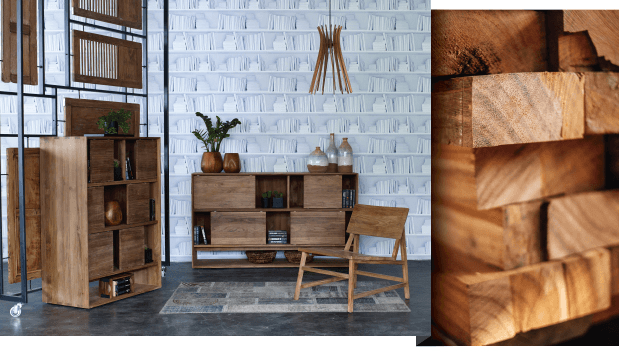 as a tropical wood, it’s perfect for wet and humid climates, which is why our signature teak collections remain firm favourites in Hong Kong and beyond. 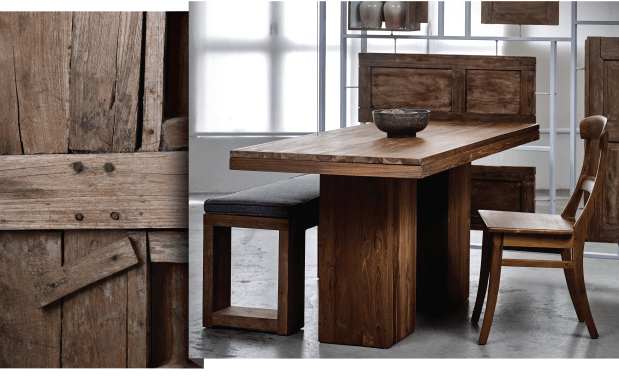 if you’re in search of furniture with added character, our reclaimed teak collections are for you. made from wood salvaged from old Indonesian houses, fishing boats and even railroad sleepers, these pieces all tell their own story. each one-of-a-kind piece is engrained with its own unique qualities, developed over time and lovingly preserved by master craftsmen. this is wood that has stood up to the elements and is made to last! look for the beauty in the imperfection and handpick the piece that speaks to you. if your home is begging for a fresh, contemporary makeover, then our light and lovely European white oak with creamy tones and straight golden-brown grains might just be the answer. 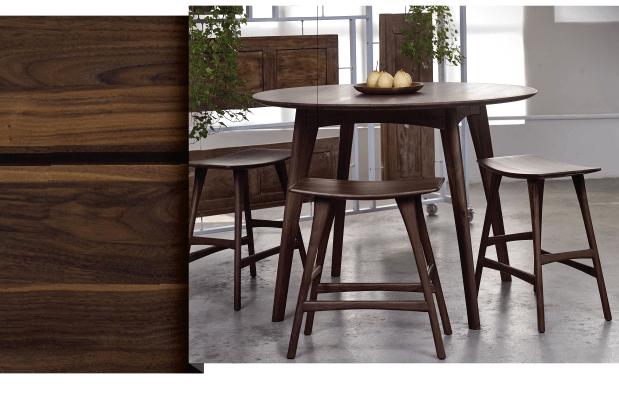 if you want a richer, warmer aesthetic, then American walnut wood is the perfect choice. with deep, chocolatey tones and ripples of lighter, honey hues swirled through, our walnut collections simply ooze understated elegance. both oak and walnut are also solid, strong, long-lasting and durable, so whatever your preference, you can rest assured you'll be choosing a piece of furniture that is made to last lifetimes. whilst wood is firmly at the heart of TREE, you’ll find a host of other materials running through our ranges. from cool ceramic to handwoven FSC™-certified kraft paper, bamboo and seagrass, recycled glass and shiny copper, our eclectic selection of lighting, soft furnishings and finishing touches beautifully compliment the unique characteristics of our teak, oak and walnut collections. sustainability is all about taking steps to protect our natural resources. we aim to be as sustainable as possible when sourcing our products and here’s how..
first up, there’s our partnership with Trees4Trees, a non-profit foundation in Indonesia who we work with to plant thousands of new trees every year. it’s our way of giving back and keeping our natural resources replenished. 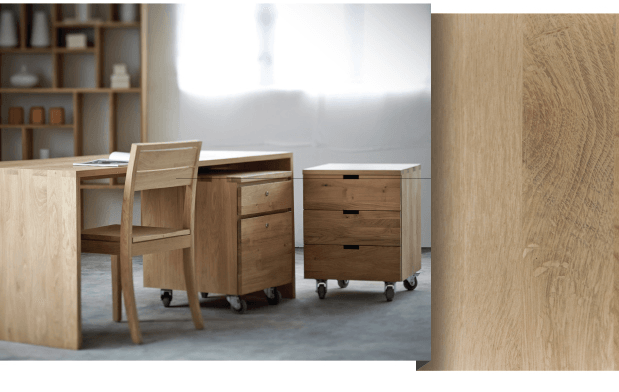 then there’s our collections that are made from wood found in responsibly managed forests certified against Forest Stewardship Council® (FSC™) standards, a globally reputed forest certification system, who make sure that vigorous sustainability standards are met. look for the globally recognised FSC logo on many of our pieces! last but by no means least, there’s the unwanted wood that we salvage and breathe new life into. from old boats and houses, there’s an abundant supply of wood that can be handcrafted into beautiful new pieces and reloved again in someone’s home.